Pope Benedict XVI just told Muslim leaders that true religion rejects violence. Here’s an aspect of Pope Benedict XVI’s just-concluded trip to Africa that deserves to be much more than a forgotten footnote. 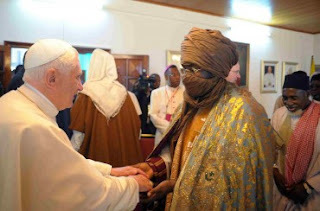 Speaking March 19 to Muslim leaders at the apostolic nunciature in Yaoundé, Cameroon, the Pope reminded them that true religion rejects violence because it violates both faith and reason. Surely the Muslim leaders will accept this feedback. Right?… Right?